We had the perfect weather this weekend. Beautiful skies and cooler temperatures. We were able to have lunch outside for the first time in a long time. 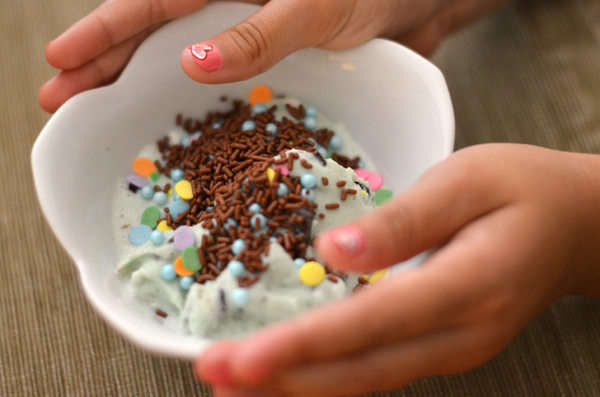 Little Miss A loves ice cream and so we always have some on hand as well as a fantastic selection of sprinkles. Because who wants ice cream without sprinkles? 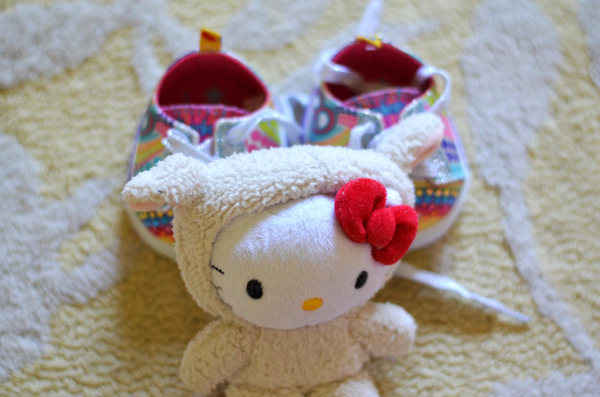 And she loves Hello Kitty as well. She prepared this beautiful vignette for me to photograph. And if you love a good salad you NEED this recipe. My good and long-time friend Carla brought it over to a dinner at home years ago (we were still single and living the life in NYC. Now she has four kids and I just the one so even though our lives are so different we still enjoy this salad constantly. The powers of a good recipe! able to withstand the test of time. I love it). Anyway, nobody had tasted something so delicious. To this day my guests are awed by this salad. It is the perfect combination of fresh, healthy and sweet. I asked Carla if she minded that I share the recipe and she gave me the OK. So here it is. 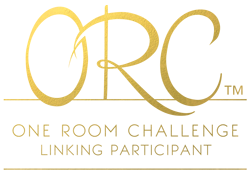 Do you have pen and paper ready? Your guests will love it. For the dressing- zest the lemon to measure 1/2 tsp. of lemon zest. Juice lemon to measure 2 Tbsps of juice. Combine zest, juice, vinegar, sugar, oil and poppy seeds in a small bowl. Whisk until well blended and cover. Refrigerate until ready to use. If you need to toast the almonds. Preheat oven to 350 F. Spread the almonds in a single layer over the bottom of a small baker pan. Bake 10-12 min. or until lightly toasted. Remove from oven and let cool. Cut strawberries into quarters. Slice onion into thin wedges. 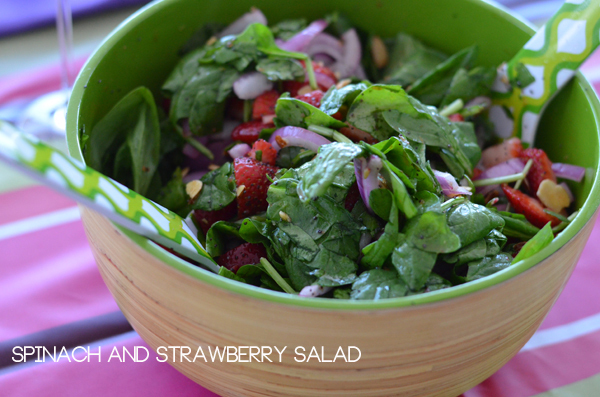 Place spinach in a large serving bowl, add strawberries, and onion. Whisk dressing and pour it over the salad gently tossing. Sprinkle with almonds. ENJOY! This sounds right up my alley. Thank you for sharing it!